It’s beginning to look a lot like Christmas… with the holidays almost upon us we would like to thank all our clients, integration partners and resellers for their continued support throughout 2018. It’s been the best one yet! This year was certainly a busy one. We were thrilled to sponsor industry leading events including the British Legal Technology Forum, NetDocuments ndElevate, Tikit National User Group and Kings Inn eLitigation conference – to name just a few! But that’s not all. In addition to all the jet setting, we launched a range of awesome new features including redaction, annotations, document manipulation, more index customisations - while still remaining incredibly simple to use. Magic! We’ve even more exciting things planned for 2019 so come join us! To make sure you don’t miss out, follow us on Twitter, LinkedIn, Facebook, Google+ and YouTube (great when you want to see our new features in action). Wishing you all a very Happy Christmas and New Year from Bundledocs. See you all in 2019! Can you believe we’ve come to our last New Feature Release post of the year. We’ve gathered together some of our exciting new updates for you to check out so keep on reading. Making the move to a less paper office is simple. Whether you want to go completely paperless or would prefer to still use paper copies of your bundles, with Bundledocs there is no choice - you can do it all. It’s easy. All bundles are automatically produced in electronic format that can be easily printed with the click of a button. But what if you need to print double sided? From speaking with our clients, we know double sided printing can be a pain. That’s why we introduced our vacat pages feature earlier this year. This allows you to force the first page of each section to the right (if it doesn’t already appear there). Following on from this, it is now possible to apply vacat pages to each document in your bundle. Similarly, this will force the first page any document to the right. Magic! Make sure to download a copy of our Bundledocs User Guide for full details. Collaborating with others on your bundle is simple with Bundledocs. We offer a wide range of features from securely forwarding your bundle to anyone (regardless of file size), working in groups or collaborating with anyone on your bundle. When it comes to securely collaborating with external third parties, we have introduced some handy new features to help make it easier for first time users. Now if you don’t know what a button/option does, simply hover over the button and a simple description will appear. The best bit? As there are only 6 buttons, getting familiar with using Bundledocs will be a breeze! Sound good? Login to Bundledocs now and give it a try for yourself. At Bundledocs we want to ensure you have everything you need to create the perfect bundle. Whether you want to change your index, change your page numbering or change the export options, it can all be done. In our latest release, we have added another enhancement to our index customization option. So what can you do now? As you may be aware, section numbering currently can be set to either numerical or alphabetical. For example it can appear as Section A, B, C or as Section 1, 2, 3 etc. Moving on from this, we wanted to give you even more flexibility. Now you can set a ‘First Display Order Number‘ for your bundle. So whether you want to begin at Section 7, Section D, or Section 77 - it’s all possible with a click of a button. Have you a specific format you want to create or any queries on the type of bundle you need to create? Get in touch with our awesome support team today! That’s a wrap for 2018! If you would like to review any of our previous New Feature Release posts, then we’ve included some of our latest below for you to check out. If there is anything else you need to know, then get in touch with us today. We love to hear from you! Looking for a quick and easy way to prepare document bundles and binders from NetDocuments? You’re in luck - we have just the webinar for you. We are delighted to be working with our partners Optiable for our upcoming webinar. A leading NetDocuments Document Management Software provider, Optiable are focused on helping law firms reduce costs, save time and increase output through the provision of world class solutions. What Will the Webinar Cover? Come and join us! Our webinar is taking place Wednesday December 5th at 11.00AM - 11.30AM CST (that’s right, it’s only a week away!). Register now to book your place. Can’t make the webinar? Not to worry. Register anyway or simply get in touch and we can send through a copy of the recording directly to you. That way you won’t miss a thing! We’ve all been there. You’ve hit generate only to discover you weren’t quite ready. No need to worry, it’s simple to stop your bundle generating. Let us show you how. What does it mean to generate your bundle? Bundledocs will revolutionise how you create bundles. When you generate your bundle, Bundledocs automatically merges all your documents into one single PDF file. It instantly creates an index page that lists all your sections, sub-sections and documents. It numbers everything, hyperlinks your complete index and adds bookmarks too. Amazing right? Is it complicated? How do I generate a Bundle? It’s incredibly simple - just click one button! Why would I need to stop a bundle generating? In most cases you won’t need to. However, if you’re creating and working on large complex bundles, this feature can come in handy. So if you ever have a time when you’ve hit generate only to discover that you weren’t quite ready yet - this will work great. How Do I Stop a Bundle Generating? So you’ve hit generate but have discovered you need to make another couple of changes. Don’t fret, simply follow these steps to stop the process. Step One: Select the ‘Save’ drop-down, as shown above. Step Two: Click ‘Cancel Generating‘. Yes, that’s really it. Now you’ve stopped the generating process, you’re free to make any changes you need. Perhaps re-order, change your index, remove that watermark - whatever it is, it’s always simple with Bundledocs! We’ve great news! 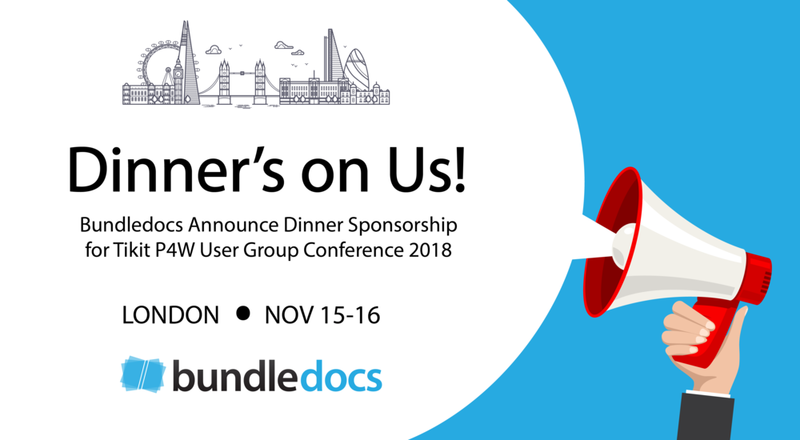 We are thrilled to announce Bundledocs, a Tikit P4W partner, will be sponsoring and exhibiting at the upcoming Tikit P4W National User Group Conference 2018 which takes place at the BT Centre, London next month. Following on from our exhibition at the NetDocuments Elevate and the London Law Expo, we are excited to be hitting the road again to showcase at the 2018 Tikit National User Group conference. Tikit recently announced this year’s event has more people than ever signed up to attend, so it is certainly not to be missed. The agenda is jam packed covering everything from the Tikit user AGM, workshops, updates on new feature releases, enhancements and exploring the product road-map, to name just a few. Are you attending the Tikit P4W National User Group this year? If so, then do drop by our stand. We will be exhibiting alongside other P4W conference partners including InfoTrack, The Link App, Perfect Portal and will be on-hand to show how simple it is to create a professional bundles from anywhere! Time: Day One begins at 09:00am and Day Two begins at 09:30am. Conference Passes: Visit Tikit’s Events page for full details on Delegate Tickets and prices. That’s not all. We’re delighted to be sponsoring the Tikit P4W NUG Conference Dinner which will take place the evening of Thursday November 15th. It will be held in the 5* Mondrian Hotel on London’s iconic South Bank. The evening will kick off with a drinks reception, with dinner starting from 8pm. Looking forward to seeing you all there!